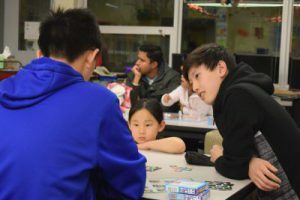 Every year, a local school, Newport Heights Elementary, hosts a game night for elementary-age kids to participate. At the event, our organization, the Washington Student Math Association (WSMA), hosts a station dedicated solely to playing math-related board games. 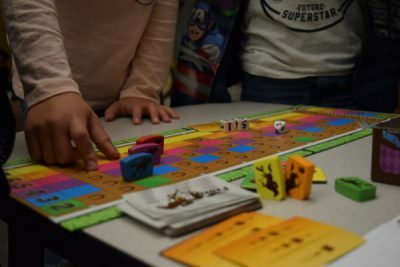 I decided to use this year’s Game Night, which took place on November 3rd, to discuss some of the most popular math games and their merits. One of the most played game was called Frontrunner. Kids were drawn to this game by its bright colors and rather simplistic looking design. To play, each kid picks a horse that corresponds with the numbers 2-7. Taking turns, each player roles 3 die and draws an equation card. On the card, there are three different equations, going from easy to difficult, each with blanks for the numbers. The player uses the numbers obtained from rolling the die to plug into the equation and solve for the answer. If any of the horses’ numbers are factors of the answer, then that horse get to proceed to the next spot. At first, I was confused because it seemed that horses with smaller numbers would have a greater advantage because the answer of the equation is more likely to be a multiple of 2 or 3, rather than 6 or 7. However, I realized that horses 2 and 3 had many more spots to move than 6 or 7 before reaching the end, a design aspect meant to make the game more fair. Frontrunner is a great game for kids who are practicing their addition, subtraction, multiplication, and division skills. 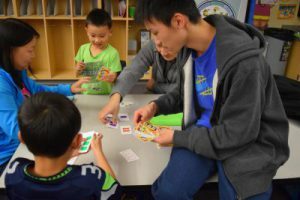 Because there are three different equations of varying difficulty on each card, the game also works to cater towards kids at all different math levels and allow them all to play together. My only reservation about the game is that each game takes a very long time to finish. Because it takes a while to solve equations and figure out the factors, kids will often get bored and lose interest about halfway through. Another popular game was called Set. In Set, 24 cards are set out. Players must find sets of three cards that are share one or more common characteristics, either shape, number of shapes, color, or pattern. The player who finds the most sets of cards wins. 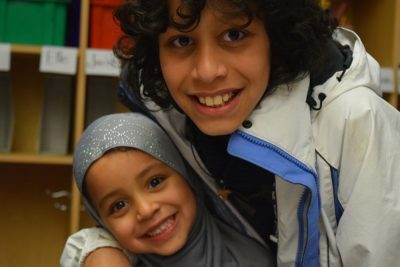 Set can be played by kids of almost all ages, even if they haven’t learned addition or subtraction yet. Each game also goes by pretty quickly, as the objective is to find sets as quickly as possible in order to beat the other players. The last game that the kids really seemed to enjoy was called Vinculum. Vinculum is also a rather straightforward game. To set up, players must first set out most of the tiles face-up, leaving a stack of them face-up. Each tile has a fraction on it. 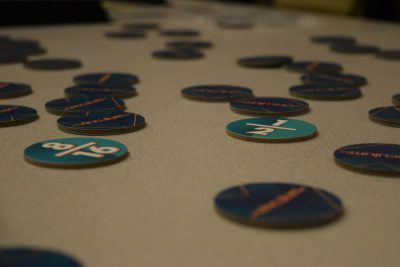 To play, one player will flip one tile from the stack over, and the rest of the players must look for an equivalent fraction in the tiles that are laid out. For example, if the tile turned over had 2/3 on it, a tile with 4/6 on it would be considered a match. The player who finds the most matches when the stack runs out wins. Vinculum is also a fast-paced game, ideal for kids who are just learning fractions. Overall, math games are a fun and often overlooked way of practicing math and can be very valuable to a kid’s learning. Besides the three mentioned in this post, there are hundreds of more math-related games out there that cater to kids of all ages and skill levels that are worth checking out.